Wildly diverse animated humor and better yet it’s without obtrusive 3D. 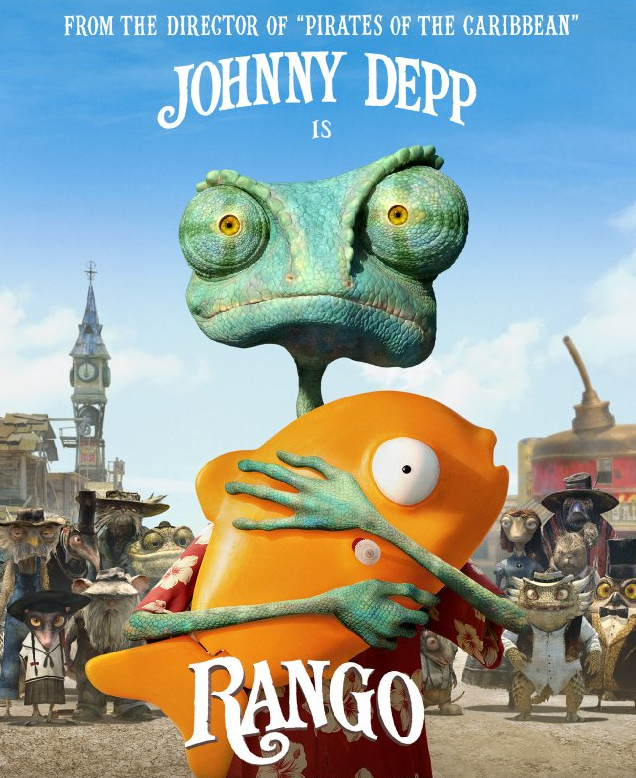 Rango features Johnny Depp as the lizard hero voice, and so you might be wondering if his wacky crackpot humor is abandoned this time. Absolutely not, Depp as vocal performer is deep within his idiosyncratic self, only he’s a pet chameleon. While his human owners are travelling on a highway, a bump and then an unavoidable reckless swerve in the road causes his aquarium – where he’s spent all of his hermetic life – to fall out the back. He is left helpless in the desert with advice from another reptilian to use his chameleon qualities to blend into the ground to avoid a preying hawk. Rango meets a Calamity Jane- type reptile named Beans (Isla Fisher), and then stumbles into the town of Dirt. In this Old West town, Rango comes off as a peculiar outcast but he quickly fakes toughness and inadvertently achieves heroism. He is made Sheriff, and then gets sucked into a water drought plot that will tickle any adult who has ever seen 1974’s “Chinatown.” The kids will dig all the creature hullaballoo. Yes, to make sure it will play well to the masses, it is assured that kids will be caught up in the broad archetypes. And yet adults will see that this is a parody of archetypes. If you haven’t seen hillbilly reptiles in a movie, here’s your chance. When Rango can’t get the job done, he commissions a bunch of yakety amateur deputies that are right out of old black & white westerns. The rodents are a bunch of warty, hairy saloon boozers. The mayor (Ned Beatty) is a wheelchair-set hunchback tortoise donning a ten gallon hat. This grousing bigshot molded out like John Huston, is set on thinking about the “future,” occasionally paraphrasing lines from “Chinatown.” The future he speaks of is the parched real estate that is of course is worth nothing when there is no water to irrigate the land. One wonders if there is a scheme at play. 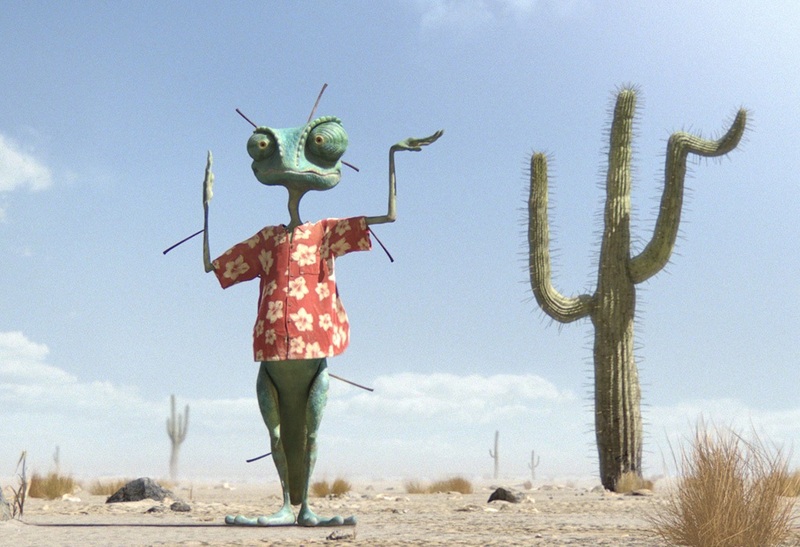 Message to amateur film scholars: Rango is a little slower to catch on than Jake Gittes. If Rango is less like Jake Gittes (OK, we’re talking about “Chinatown”) then he’s more like Hunter S. Thompson of “Fear and Loathing in Las Vegas” (1999). In fact, as an example of subversive humor, Rango crashes into the windshield of gonzo writer Thompson while (implied) he’s on route to Las Vegas. The oddness of out-there humor doesn’t stop there, not by a long shot. If quality, inventive dialogue is precious to you then this has plenty of out-there lines. (SPOILER ALERT, if you need not hear one of the best lines): Bedraggled at one point, Rango is not quite sure he’s alive and so he wonders if he’s in heaven. The Spirit (Timothy Olyphant), configured to be a Man With No Name or perhaps just an apparition replies, “If this were heaven we’d be eating pop tarts with Kim Novak.” This is said at a high point of desert disillusionment. There is plenty of delightfully weird dialogue that prompts audible attention, an animated rarity. Mariachi Owls also provide chorus and commentary. For pop culture references, you can count on “Apocalypse Now” with bats substituting for helicopters, “The Good, the Bad and the Ugly” with the Man with No Name figure, and “High Noon” showdowns held in the deadlock middle of town. This is the first full-length animated project to come out of Industrial Light & Magic, a laudable beginning. Now a minor complaint could actually be made that the film print seeps into too many brown colors that gives it too aridly dry a visual look. But that would have only been a sore distraction had it not been terrifically written, and let’s remember, any animated feature not presented in 3D already has a major lucid plus going for it. The main screenwriter is unexpectedly John Logan who wrote “Gladiator” and he must have prioritized that his wit be catered to adults first, smart kids second. And director Gore Verbinski (“Pirates of the Caribbean,” “Mousehunt”) doesn’t surrender his creativity, he keeps coming up with new visual surrealism and odd tangents right through the end. But the tangents do lead to an excess that makes his film a tad overlong. Film Cousins: “High Noon” (1952); “Charlotte’s Web” (1973); “Chinatown” (1974); “Pirates of the Caribbean: Curse of the Black Pearl” (2003).